In the 1990’s, Cuisinart, faced with competition from Kitchenaid, developed and marketed a food processor intended for countertop use in the home instead of for commercial and catering operations. They really started promoting them in 1991, with coupons and newsletters. After using Robot Coupe processors in commercial kitchens, I knew what they could do, and convinced my husband I had to have one. I subscribed to their excellent newsletters for 2 years…I think that they then dropped them, although I can’t remember for sure. 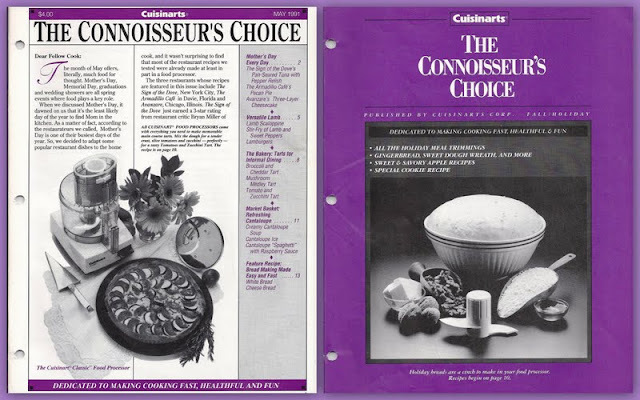 However, I have 2 years’ worth of The Connoisseur's Choice Newsletters, 1991 and 1992, about 13 issues. I have used them so much; I now keep them in a ring binder. For several years I made my yeast breads in my processor exclusively and still do when I only need one loaf or rolls or sweet bread dough. It also simplifies vegetable preparation, an aid when canning or freezing. I also buy bulk quantities of cheese and shred it in my processor; often very good cheeses are not available in the pre-shredded form. Myrna and I are going to share some of our favorites from these newsletters, as well as a few I hadn’t tried until now. Not all the recipes in the newsletters used a food processor, because by this time, Cuisinart was branching out into cookware, hand blenders, ice cream makers, coffee and espresso makers, hand mixers, microwave ovens and scales. Many of these recipes can be made by other methods; using a mixer, mandolin, chef’s knife, etc., but they are so much easier with a processor. I give mine precious counter space in my small kitchen. If you don’t have a processor, try these recipes using traditional methods, you’ll still enjoy them. I haven’t seen these recipes on their current website; sadly, it seems that they didn’t add this treasure trove to their recipe site. However, these newsletters and recipes expanded my culinary repertoire with their excellent, clear directions, hints and photos. However, they weren't really heavily marketed out here in the hinterlands until Conair bought out the company. We agree that we love 'em! Lucky you to have seen their first publication! Had my first Cuisinart in 1985 and subscribed to their newsletter in November 1985. It was called called The Cuisinart Cook then. August of 1988 they changed the name to The Cooking Edge. In April, 1990, it was renamed again to The Connoisseur's Choice. The newsletter was still coming out on a monthly basis until May, 1991. The last issue I have is December 91 - January 92. I still have all those newsletters and the index they sent out periodically. What I always enjoyed about the recipes was that they were seasonal. I still refer to them from time to time. For St. Patrick's day I still make their Irish Soda Muffins as a bread. The recipe is from March 1986 and a tradition at our house. Lucky you...I wish I had seen their earlier issues! I am in the process of moving, but once I am settled I can scan some for you if you'd like. That's a very kind offer, but too much work for you. Hope your move goes well...that can be a lot of work and worry.